← How many baptist pastors are married? The rubrics of the Novus Ordo Missale Romanum and the tradition of many centuries have the priest at the altar facing liturgical East. That is to say, as he celebrates Holy Mass with a congregation present, there are moments when the priest is instructed to turn to the people and then to turn back to the altar. Hence, the congregation and the priest, when he is at the altar, together face liturgical East. This arrangement reveals that the priest is the “head” of the congregation, “body. He stands at the head of the physical church as the people are in that church’s body. All of this reflects the invisible reality that Christ is the Head of the Body the Church. From Church’s earliest days, and in keeping with the prayer practices of the Jews, our forebears thought Christ would return in glory from the East. Moreover, if I remember correctly, after her apparitions at Fatima, Our Lady disappeared into the East. Celebrating towards the East, ad orientem, is symbolic. It doesn’t have to be the literal geographic East. It is ideal to be able to face the literal geographic East, but we can create a liturgical East in any direction. So long as you are all facing the same direction, you are symbolically facing the East. Thus, we turn to the Lord who is coming. Those of you will access to a good academic library might look up an article by M.J. Moreton: “Εἰς ἀνατολας βλεψατε: Orientation as a Liturgical Principle”, Studia Patristica 17.2 (1982) 575–90. Moreton demonstrates it was the universal custom of the early Church to face East, even if that meant that at a certain point the congregation itself had to turn around to the East. 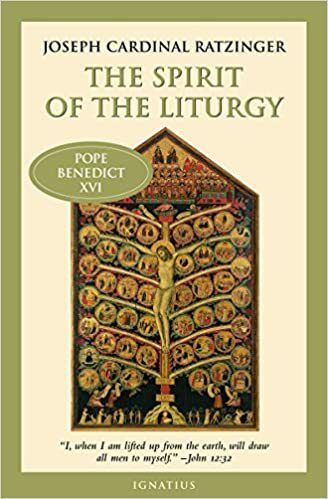 The great liturgical scholar Klaus Gamber wrote about this as well in The Reform of the Roman Liturgy: Its Problems and Background. There are great resources on ad orientem worship which also explore the spiritual dimension, the deeper significance of this entirely Catholic way to pray together. Ratzinger has a deep reflection on the meaning of worship ad orientem. Card. Sarah made the invitation and Lib World threw an authentic spittle-flecked nutty, thus proving the solid-gold value of his vision. 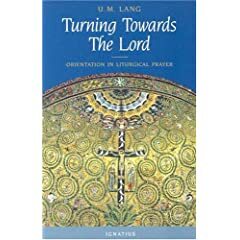 Gamber, by the way, said that of all the harmful things that came from the post-Conciliar reform, turning altars around was the most damaging. Ad orientem worship is perhaps the single most important (initial) change that can be made in an effort to revitalize our sacred liturgical worship. Moreover, priests don’t need permission to celebrate ad orientem and, according to law, they cannot be legally prevented. They can, however, be bullied. This entry was posted in "How To..." - Practical Notes, Hard-Identity Catholicism, Liturgy Science Theatre 3000, The future and our choices, Turn Towards The Lord and tagged ad orientem, Archd. Detroit. Bookmark the permalink. Nothing like a cowardly bishop to bow down to one complaint. This is one of the big problems in the church. One day, all these old fogeys who complain will die and Catholics can worship as Catholics have done throughout the ages. I remember the cold wet mornings during US Army Ranger School back in 1980 … we were all tired, wet, miserable, hungry, tired, wet … and tired. Did I mention we were tired and wet and cold? Anyway, our daily morning routine was to face the sun when she rose. Just seeing that glimmer of light … we would start to warm, even though the temperature had not changed. Slowly, as the sun got stronger, we warmed. We were still cold, wet, miserable, and hungry. …… but we were SPIRITUALLY warmed by the Great Heat-Tab In The Sky™. Yes, even US Army Ranger Students faced ad orientem …. we all knew, intuitively, that it gave us our strength to continue on. I was reading about this recently. The idea was to build the Church in such a way that the priest saying Mass would be facing east. If this might not be possible, and the Church faced West. The priest might find himself facing the people because they were also ‘to the East’ of the altar. But then I just started thinking about side altars…so I am confused. BTW do you believe Christ was born 9 months after March 25th? Or six months after June 24th? Just watched my Pastor tell a crowd of catechumens that “We don’t know when Christ was born, sorry.” How do I talk to him about that…it weakens the faith it weakens belief in the historicity of scripture, and the infallibility of the Church and tradition. My home parish was built on the eve of the Council with the sanctuary facing west. This was done on purpose to prevent the ad orientem posture from making sense, cosmologically speaking. The architects had to finagle the church into a space that would have been perfect if set toward the east, but now successive generations have had to trip over themselves to make sense of this Wrong-way Wooten. The good guys just went along, never suspecting the enemy was making long-range plans. I wonder how many in theis diocese have complained that their ad orientem worship is being taken away? Flood the chancery with testimonials about how ad orientem worship has brought you closer to Christ and made you want to pray, fast, and, ahem, GIVE ALMS. While “… after Vatican II” is chronologically correct, so is “after the death of Robert Kenned” and “after Woodstock”. The turning of the altars was not prescribed by Vatican II – perhaps we shouldn’t use it as a touch point for this issue. One complaint? Just one? That’s all it takes if the bishop is a modernist, all too willing to throw a good and faithful servant under the bus. And here’s another one, Father Dwyer removed from parish duties because he dared to include some aspects of Catholic tradition into the Mass on Sundays. Father Dwyer’s address to the meeting can be read here. From his remarks, it is clear that at least one parishioner objected to his stance against abortion. Apparently we have so many priests in the Church that many are disposable. When a boss takes draconian action against a subordinate on the basis of just one complaint, then it’s what the boss wanted to do all along. Wretched to see so many good priests being hassled by their clueless elders. At PrayTell, the editor took up Pope Francis’s label of “monsters” to describe the traditionally-minded young clergy. What a testimony to charity, eh? This recent radio interview with Br. Andre Marie on ad orientem goes into the issues in an engaging way, and someone put it up on YouTube with a nice slideshow. So grateful for Bishop Thomas J. Tobin. Since I went ad orientem full time 6 years ago, there are now four parishes ad orientem. Since regularly attending Masses said ad orientem (in both forms) I have become increasingly convinced that this is one of the most important things that priests can do to create the proper focus and mindset at Mass. Actions speak louder than words, a picture is worth a thousand words, etc., and simply using this posture can teach more about the nature of the Mass and the function of the priest than any number of sermons or articles on the subject. It’s disappointing (if not surprising) to see bishops over-reacting in this way to a small number of complaints. Like the reaction to Cardinal Sarah’s announcement, though, I think this demonstrates the value of ad orientem worship. Those who like to downplay the sacrificial nature of the Mass KNOW how incompatible this posture is with their notion of the Mass as primarily a shared meal, a gathering of the community. They know how powerfully it communicates to those attending that something sacred and extraordinary is occurring at the altar. That’s why they find it so disturbing, why they furiously demand its suppression. What progress we have made, though. Fr Acervo is quite right that what we are seeing now would have been unthinkable 20 or 30 years ago, in a mainstream parish or seminary. There is a long way to go, but I see green shoots of hope. I expected that the bishop would ban ad orientem celebration outright. That’s what I’ve been used to. In my experience, it’s been vastly easier to have regular EF Sunday Masses, even ones listed on diocesan websites, than to have OF Masses offered ad orientem, in any language. God plows the hard ground with hardheaded priests. How does it weaken the faith — or weaken belief in the historicity of scripture, and the infallibility of the Church — to say that we don’t know the calendar date of Christ’s birth? The Bible never gives a date. The Church has never infallibly declared a date. I think you are confusing small-t tradition (Church custom) with big-T Tradition (Church doctrine).